This very old air has been set to various words, but most famously appears as “The Broom of the Cowdenknowes”. 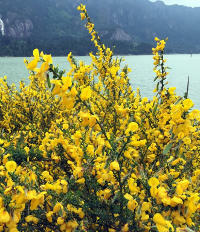 The title of the song references the Scotch Broom (Cytisus scoparius) flower, a vibrant yellow flower found throughout Scotland, including the barony of Cowdenknowes. Stems of the plant were at one time bundled together and bound to sticks for use as sweepers, hence the name ‛broom’ for the common implement. The melody can be traced back to the mid-17th century and is probably Scottish in origin, or at least so believe most scholars. Its earliest appearance in print is in John Playford's The Dancing Master, published in 1651. Thanks to Jean for suggesting this tune!